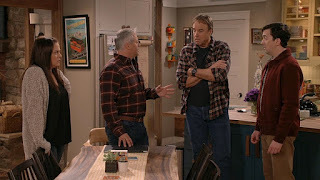 On this episode of Man With a Plan, the gang needs a loan to continue working on the house, leading to an awkward encounter for Andi and Adam. The home inspector tells Adam, Andi and the guys that the house they are working on failed the inspection because of the sewage system, and they can't afford pay for it, even with their bank loan. They decide to go to different banks for the loan. The four of them go to as many banks as possible, but nobody wants to give them a loan. Finally, Lowell and Andi find someone willing to give them a chance. Andi calls Adam to tell him the good news. The man from the bank asks Andi (and only Andi) to dinner to talk over the deal, and she agrees to it. Lowell wants to tell Andi about the dinner, but Andi tells him to keep it private, because Adam gets too jealous. Lowell doesn't think he can handle lying to Adam, but Andi convinces him to try. That night, Lowell passes out when Adam asks where Andi is. After Marcy fixes him up, Lowell tells Adam that Andi is at dinner with the man from the bank. He rushes there to stop the dinner, and Marcy follows him. At the restaurant, Adam discovers that Joe and Funchy are eating there together, and that Joe is totally fine. Marcy stops Adam from interrupting Andi's dinner. Adam observes them from another table, but Andi recognizes the back of his head when he slides the chair past the table. Andi gets annoyed and tells Adam it's not a date, but the loan guy tells her it's a date, and that they aren't getting a date. 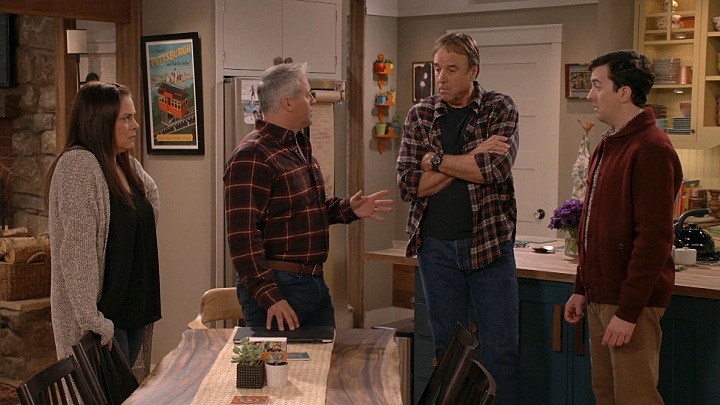 Everyone's upset when they get home, until Lowell comes in to tell them that he got the money from Jen, through a bit of blackmail. This was a very good episode, even though it pit Adam and Andi against each other yet again. However, it did so in a different and much more comical way than usual, and I applaud the show for it. I really enjoyed Marcy's increased screen time (though it still isn't enough) in this episode, and I'm glad that she actually helped the plot advance this week, unlike usual, when she's usually just there to say a funny line or two and that's it. Guest star Ian Gomez was also thoroughly entertaining in his role, and he made his creepy-yet-pitiful character work when others wouldn't have. The conclusion to the episode and the running joke that it triggered was one of the endings to any MWAP episode that I can remember. All in all, a thoroughly entertaining episode that is definitely one of the season's best.